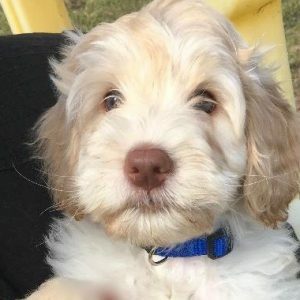 We are labradoodle breeders with a litter of medium Australian labradoodle puppies and a sweet litter of miniature Australian Labradoodle puppies this spring. There are still a few darling puppies available. They are beginning their Head Start training and will soon be ready to go to their forever homes. These will be the last over the moon babies this year. Rocky has a very macho name but he is one of the sweeter puppies. He loves to play but he also likes to watch the flowers grow and he is a very cuddly boy. This litter has more than its share of loving and cuddlers. He is a big favourite with the children and our family because he is so gentle. Rocky's mother is Bella and his father Cagne. 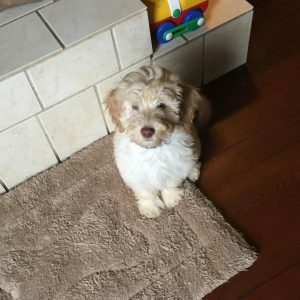 We have a very small breeding program focused on providing a few loved Australian labradoodle puppies that will become healthy and loving family pets. We take great care in raising and training puppies amongst friends and family within our rural home alongside our own labradoodles. Our small breeding program allows us to give each puppy individual attention giving them the best opportunity at becoming socialized and well trained puppies. Welcoming a puppy into your home is a big step. 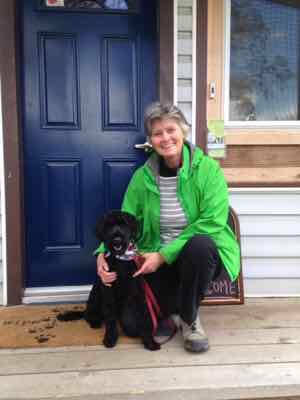 We have found that our Australian Labradoodle families put a great deal of thought and care into their decision. Many families have done extensive research and are interested in the history of the Australian Labradoodle as well as the differences between the different types of Labradoodles. 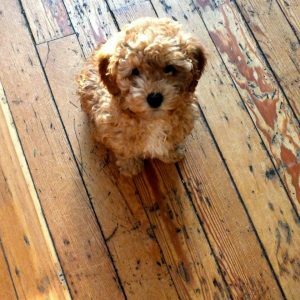 Take the time to explore our site to learn more about Labradoodles, adopting a puppy and preparing for your new puppy’s arrival into your home. Once your puppy arrives, the loving, caring and training begin. Explore our site for great information on caring for your puppy. You’ll find tips on grooming, health, training ideas, introduction to young children and online Labradoodle shopping possibilities. 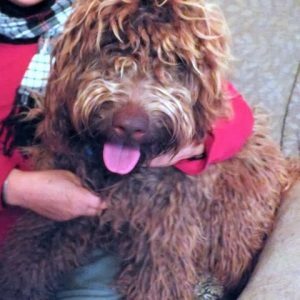 We also love to share your Labradoodle stories and pictures. Our dogs have brought us such amazing joy. Every time we place a dog with a family we relive the happy excitement of the arrival of a new puppy. It is the best! Joyful temperaments, non-shedding, and loyal. Labradoodles are wonderfully loving companions. From research to delivery. We are here to help you enjoy every step of the adoption experience. Amazing puppies start from fabulous parents. 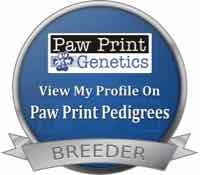 Learn about our wonderful labradoodle mothers and fathers. A labradoodle is a sensitive dog and training is easy. We begin the training process here when the puppy is very young. Chico is 1 1/2 tomorrow - where did the time go. He really is the most wonderful little fellow with a great sense of fun, easily making friends with all the dogs & people he meets. Here he is yesterday outside the groomers with his spring cut. Thank you for the best little companion I could ask for. Sadie & Chester certainly produce special puppies. We strive to breed puppies that are non-shedding and allergy friendly. If you have concerns about allergies in your house please find more information about the labradoodle and allergies on our Labradoodles and Allergies Information page. Our puppies have flown all over North America and even to Europe. They can do this easily because we make sure before they set out on their journey they are crate trained and are old enough to travel. Our puppies stay with us until they are 11 weeks of age. They are spayed or neutered and have had two out of the three sets of vaccinations. They receive Bordatella (kennel cough) vaccine if they are older and go to play group. International travelers receive a rabies vaccine. Usually puppies travel more easily than many humans, Jean included. Our Labradoodles are trained and temperament tested to be placed as therapy dogs. 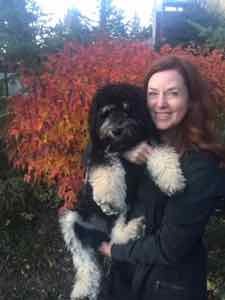 This is Dr. J Moench with Tilly who recently completed the introduction to Animal Assisted Therapy.